Not to be confused with Guyana or French Guinea. 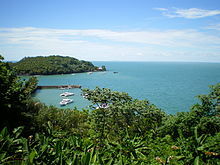 As of 2007[update], the Amazonian forest, located in the most remote part of the department, is protected as the Guiana Amazonian Park, one of the ten national parks of France. The territory of the park covers some 33,900 square kilometres (13,090 sq mi) upon the communes of Camopi, Maripasoula, Papaïchton, Saint-Élie and Saül. A chronic issue affecting French Guiana is the influx of illegal immigrants and clandestine gold prospectors from Brazil and Suriname. The border between the department and Suriname, the Maroni River, flows through rain forest and is difficult for the Gendarmerie and the French Foreign Legion to patrol. There have been several phases launched by the French government to combat illegal gold mining in French Guiana, beginning with Operation Anaconda beginning in 2003, followed by Operation Harpie in 2008, 2009 and Operation Harpie Reinforce in 2010. Colonel François Müller, the commander of French Guiana's gendarmes, believes these operations have been successful. However, after each operation ends, Brazilian miners, garimpeiros [fr], return. Soon after Operation Harpie Reinforce began, an altercation took place between French authorities and Brazilian miners. On 12 March 2010 a team of French soldiers and border police were attacked while returning from a successful operation, during which "the soldiers had arrested 15 miners, confiscated three boats, and seized 617 grams of gold... currently worth about $22,317". Garimpeiros returned to retrieve their lost loot and colleagues. The soldiers fired warning shots and rubber "flash balls", but the miners managed to retake one of their boats and about 500 grammes of gold. "The violent reaction by the garimpeiros can be explained by the exceptional take of 617 grammes of gold, about 20 percent of the quantity seized in 2009 during the battle against illegal mining", said Phillipe Duporge, the director of French Guiana's border police, at a press conference the next day. ^ a b c INSEE. "Estimation de population par région, sexe et grande classe d'âge – Années 1975 à 2019" (in French). Retrieved 15 January 2019. ^ a b c d e f "Gross domestic product (GDP) at current market prices by NUTS 2 regions". Eurostat. Retrieved 8 April 2019. ^ "FAOSTAT - Land Use". Food and Agriculture Organization. Retrieved 3 February 2019. ^ "Parc amazonien de Guyane, le plus vaste Parc national de France et de l'Union européenne". Guiana Amazonian Park. Retrieved 3 February 2019. 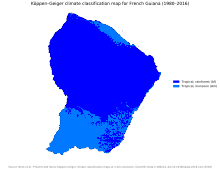 ^ a b c "Panorama de la population immigrée en Guyane" (PDF). INSEE. Retrieved 2 February 2019. ^ "Illegal, polluting and dangerous: the gold rush in French Guiana". The Guardian. Retrieved 2 February 2019. ^ "The fight against illegal gold mining in French Guiana". France 24. Retrieved 2 February 2019. ^ Faget, Dominique (3 April 2017). "Cazeneuve calls for continuation of dialogue in French Guiana". Radio France International. Retrieved 4 April 2017. 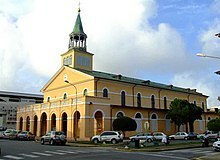 In a referendum in January 2010, French Guiana voted firmly against autonomy. ^ Marot, Laurent (27 March 2017). "La Guyane paralysée par les mouvements sociaux". Le Monde. Retrieved 3 April 2017. ^ "Guyane : manifestations historiques pour la "journée morte"". Le Point. 28 March 2017. Retrieved 4 April 2017. ^ International Monetary Fund. "World Economic Outlook Database, April 2019 – Gross domestic product per capita, current prices, U.S. dollars". Retrieved 9 April 2019. ^ CEROM. "Les comptes économiques de la Guyane en 2017" (PDF). Retrieved 9 April 2019. ^ INSEE. "Indicateur conjoncturel de fécondité des femmes – Ensemble – Guyane" (in French). Retrieved 16 June 2018. ^ INSEE. "TABLEAU P3D – INDICATEURS GÉNÉRAUX DE POPULATION PAR DÉPARTEMENT ET RÉGION" (in French). Retrieved 16 June 2018. ^ INSEE. "Indicateur conjoncturel de fécondité des femmes – Ensemble – France métropolitaine" (in French). Retrieved 16 June 2018. ^ "Ponte entre Brasil e União Europeia é aberta no Amapá após 6 anos pronta". Amapá (in Portuguese). 18 March 2017. Retrieved 18 March 2017. ^ INSEE. "Historique des populations légales". Retrieved 28 January 2018.